Summer first aid courses for children. Running in Aldridge, Walsall. Our summer first aid courses for children are now released. Please read on for new dates for our summer first aid courses for children. Running over the summer, we have raised two dates for first aid for children! Our first aid courses for children aim to educate children on what to do in an emergency. If you are the only adult at home, would your child know what to do? Would they know when to call 999, or even know how to? On our first aid courses for children, we will teach children the importance what to do in an emergency and why we need to learn our address. For the older children, we will learn CPR and we will have the opportunity to listen to a defibrillator. Young children will learn about the dangers around the home and how to remove these if they ever come across an injured or unconscious casualty. Our aim on our summer first aid courses for children is to have fun and to enjoy themselves. No child is pressured to take part if they wish not too. Will you join us on our courses, if you can’t, we are able to come to you at a minimum of 4 children present*. • How and when to get adult help, and when to call 999. This summer first aid course is 2 hours long, charged at £12.50 per child. We are offering discount for any siblings at £10.00 each. All children will receive a certificate of attendance and activity pack. *maximum numbers of 12 children on the first aid course. 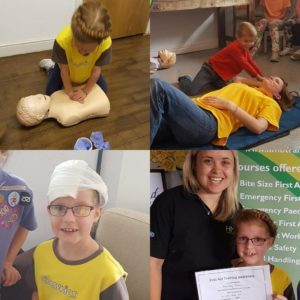 This entry was posted in Children's First Aid, courses, cpr, firstaid, paediatric, walsall and tagged Childs CPR, Cilds First Aid, summer childrens courses, Summer first aid courses for children. Bookmark the permalink. ← I don’t need to attend a first aid course!